Do you love the planet but also love meat? Then check out the Environmental Working Group's 2011 Meat Eater's Guide to Climate Change and Health. With the help of environmental analysis firm CleanMetrics, the EWG assessed the "cradle-to-grave" carbon footprint of 20 popular types of meat, fish, dairy, and vegetable sources of protein. The study includes the greenhouse gas emissions of conventionally produced (non-organic) meat at every stage of production, from the growing of animal feed to the disposal of unused food. The EWG found that lamb, beef, cheese, and pork generate the most greenhouse gases (mostly methane and nitrous oxide). Yes, cheese. So "vegetarians who eat dairy aren't off the hook." Instead of these high-impact foods, opt to get your protein from lentils, tofu, beans or peanut butter; these foods have the least greenhouse gas emissions. An appealing infographic demonstrates the carbon footprint of all the foods analyzed, in terms of car miles driven per 4 oz. consumed. The Meat Eater's Guide includes a "Tips for Meat Eaters" section, which lays out some rules to live by if you must eat meat. First of all, eat less meat and dairy. When you do eat meat, eat "greener" meat that is grass-fed or pasture-raised, antibiotic- and hormone- and nitrate-free, certified organic, certified humane, and/or low sodium. But even if all meat eaters follow these guidelines, it still won't be enough to reverse the damage the meat industry is doing to the environment. So the EWG suggests getting in touch with political representatives to encourage them to change the policies that allow (and encourage) the industry to be so environmentally damaging. For instance, taxpayer subsidies for animal feed should be cut and programs that support pasture-raised livestock should be supported; regulation of concentrated animal feeding operations (CAFOs) should be more strongly regulated; conservation requirements on farms that collect subsidies should be increased; etc. Susan Carpenter of the LA Times' summarizes the EWG's findings here. She quotes TV chef Mario Batali, who endorses The Meat Eater's Guide, as saying: "Asking everyone to go vegetarian or vegan is not a realistic or attainable goal, but we can focus on a more plant-based diet and support the farmers who raise their animals humanely and sustainably." I agree with Batali - I think it's unrealistic to expect most Americans to cut meat out of their diets completely. But if you're willing to commit to eating less meat and making sure the meat you do it is as environmentally sound as possible, sign the EWG's "pledge to eat less and greener meat." They hope to get 100,000 supporters to agree to give up meat one day per week (why not celebrate Meatless Monday?) and to eat more fruits and veggies. 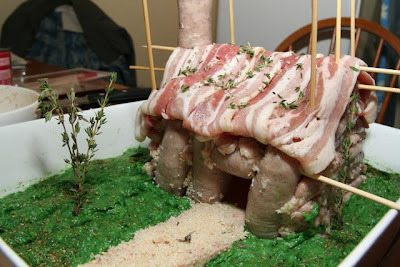 Let's all move out of our collective meat house before it collapses around us. It's starting to smell pretty rancid, anyway. If we can live without these animals and what we take from them - and all those who stay vegan year after year are proving it can be done - then we can leave habitat to other species, leave off killing, and leave off the pollution and greenhouse gases too. People have known for decades that it is more efficient to eat lower on the food chain. Lowest on the food chain is blue green algae (spirulina) that doubles its mass every 3 days. But people eat this since it is a superfood with more vitamin B-12 than liver, more omega-3 than fish, more calcium than milk, more vitamin E than wheat germ, more iron than spinach and on and on. The Japanese started consuming it after people were getting radiation poisoning from Nagasaki and Hiroshima atomic bomb explosions. They found that it helped the body get rid of radiation poisoning. The green algae, chlorella, doubles its size every 2 days. It is the #1 supplement in Japan (longest living people). Many believe in the golden rule or karma. So they want to harm the planet as little as possible. Millions of Buddhists have been vegetarians for thousands of years. Many people who do yoga are vegans. We now have thousands of raw vegans who eat all the food raw since that is what all the wild animals do. Debbie Peirce (Rose Goddess) was depressed for over a year and cured it by becoming a raw vegan. I am vegan but as a child, I loved meat more than anyone else since we ate the expensive highest quality Kosher meat. We ate out 4 times a week while growing up. At around age 13 I tried filet mignon and then I was eating it 4 times a week when we ate out. They said that I was on a filet mignon kick. It is all a matter of individual consciousness. We are alive to raise our consciousness since that brings greater happiness. I know an 18 year old woman that has been a vegan for years. Not only that, but she is an activist for vegan diet and peace. I did not even become a vegetarian until age 20. Ex-President Bill Clinton became a vegan except for fish occassionally. He did not do it to help the environment. He did it because he did not want to die! Are you Irish? Meghan is an Irish spelling like Vaughan. I forgot to mention something. Raising all these animals creates the greenhouse gases carbon dioxide, methane and nitrous oxide. But you knew that! Blue-green algae existed billions of years ago before any plants or animals existed. It is neither (technically cyano-bacteria). What does this have to do with gases? At that time there was no oxygen in the atmosphere. It put the oxygen in the air. But do not eat it to help the planet. Be selfish like Bill Clinton. Simply stated, organic blue green algae is the single most nutrient dense food on the planet. Powerful energy booster due to its incredibly high nutrient concentration. High concentration of anti-oxidants, allowing the body to rid itself of toxins and free-radicals more easily. Immune system strengthener. Clinical studies show that Blue-green Algae sends the Natural Killer (NK) cells into the blood stream. From there, these NK cells can find damaged tissues and begin to fight free-radicals. Stimulates stem cell release and movement, helping to regenerate damaged body tissue. Very absorbable to the body. Around 97% of the vitamins, minerals and enzymes found in blue-green algae are easily absorbed into the system. Most vitamin supplements are only 5-25% absorbable. Reduction in headaches and pain. Improves digestion. Blue-green algae creates a coating effect on the stomach. Powerful detox effects allow us to rest easier, as they body does not have to work so hard to cleanse while we sleep. Weight reduction. Helps to balance food cravings. High protein content strengthens the hair, nails and skin. Beneficial effect on brain development, reducing in depression and anxiety. Helps us to cope with stressful situations more easily. So eat lower on the food chain! Not to help the planet. That is a side effect. But to help you since you are the most important thing in the entire universe. I am totally sure of this! Chuck: Thanks for all that awesome info! I think "selfish" reasons might be more motivational for a lot of people :) And yes, I'm Irish! After I posted the above I saw your other website and Facebook page. It looks like you and your family are from the Boston area. I think that area has more Irish than any other area. Also you must be extremely smart, having gone to Harvard. I love smart women. Have you heard of Greg Smith? He is a super genius. He went from 2nd grade to 9th grade in 1 year. His I.Q. cannot be measured-- it is off the charts! Now when he was 2 years old he was reading about which dinosaurs ate meat and what their teeth were like. So he knew that humans were meant to be vegetarians (plant eaters). Not only did he become vegetarian at age 2 but he convinced his whole family to become vegetarians. He went to college at age 11! There was an Irish mayor of Boston. He had a daughter, Rose Fitzgerald. She married Joseph Kennedy. They had a child, John Fitzgerald Kennedy, and he became president of the U.S. I am half Irish and half Jewish. "The study includes the greenhouse gas emissions of conventionally produced (non-organic) meat..."
Not that I'm a big defender of eating meat, but conventionally produced modifier is huge here. Dairy-lovers can be "off the hook" if they consume products from organic, grass and browse fed animals. The argument that this takes too much land from other animals may have a point, but only when you don't include the land that could be given back if the equivalent amount of grains were no longer produced. Domestic animals are not the problem. Industrial agriculture -- whether in confinement feedlot operations, or thousands of acres of monoculture grains -- is the problem.